Thomas Hillgrove presents this dance as a 16-bar sequence composed of two 8-bar parts, providing two different versions of Part II. Today, it can still be danced as a sequence, but more often, elements of these parts are mixed and matched at will. The essential Varsovienne concept (point, draw back) can be applied in many different contexts. 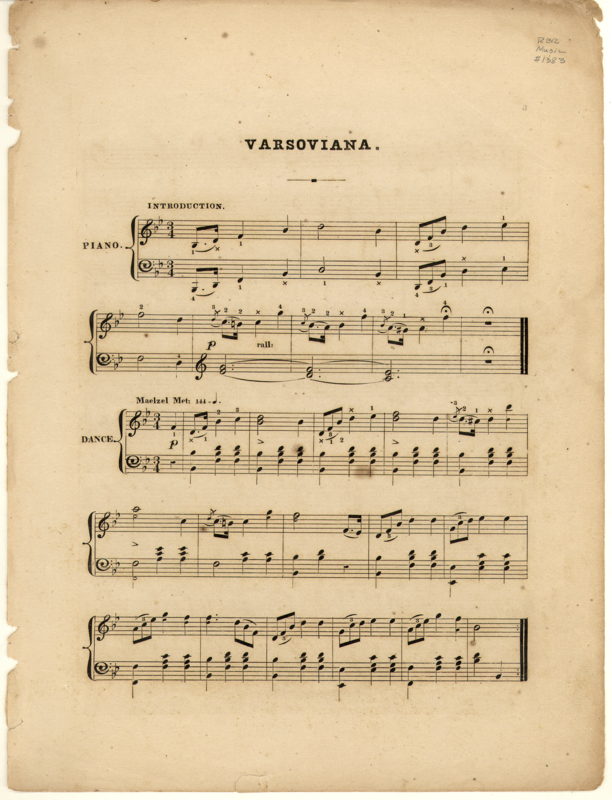 For example, Hillgrove's version of the Varosvienne uses the Polka Redowa as the foundational step, but the basic Varsovienne concept can also be applied to a Waltz (simply replace "Polka Redowa" with "Waltz" in the descriptions below). Likewise, the basic Varsovienne concept can also be applied to Polka, as is the case in Zulma L'Orientale. 1 bar: Half turn of Polka Redowa. 1 bar: Point leading foot (his right, her left) straight along LOD (2nd position) (count 1), then draw it back behind the trailing foot (count 3). Repeat opposite, then repeat the whole thing (8 bars total). 3 bars: One and a half turns of Polka Redowa. Repeat opposite (8 bars total). 2 bars: Two mazurka steps à la Polka Mazurka and La Koska. * This is actually the original version of Part II from Hillgrove 1857 & 1858, relegated to the role of alternate version in Hillgrove 1863. This is a very easy and graceful dance, and may be readily acquired in one or two lessons by persons who are familiar with the other round dances. First Part—The gentleman rests on his right foot, with his left foot slightly raised behind, and he commence with a slight spring on his right foot, and slides the left foot forward (count one)—then bring the right foot up to where the left is, raising the left foot in front (count two)—then fall on the left foot, raising the right foot behind, and at the same time turning half round (count three)—then step forward with the right foot, the heel being raised and the toe touching the floor, and there pause (counting four and five)—then bring the right foot back behind the left, slightly raised (count six). This occupies two bars. Then spring on the left foot and slide the right foot forward, repeating the same as before four times. In all eight bars. The same is repeated with the opposite feet (four bars), thus making in all sixteen bars for the entire dance. For the lady the directions are precisely the same, only reversing the feet, that is right for left and left for right. It may be danced ad libitum, turning either to the right or the left. Maelzel Met: 144 [quarter notes]. This is very easy and graceful dance, and may be readily acquired in one or two lessons by persons who are familiar with the other round dances. Commence with the left foot, and take one step of the Polka Redowa, turning half round, (count three). Then step forward (sideways) with the right foot (to the second position), the heel being raised, the toe touching the floor, and there pause (while counting—four and five); bring the right foot back behind the left, slightly raised (count six—Two bars). 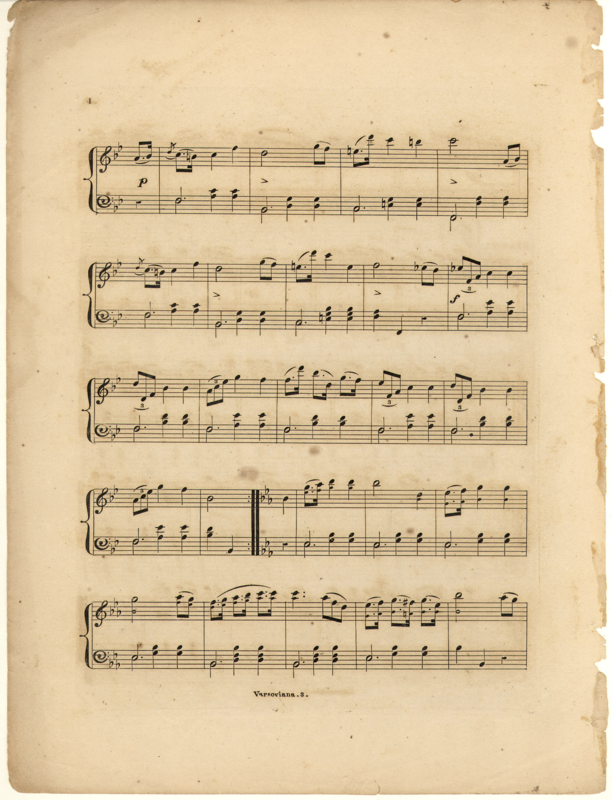 Then recommence with the right foot, and repeat the first part four times—in all eight bars. 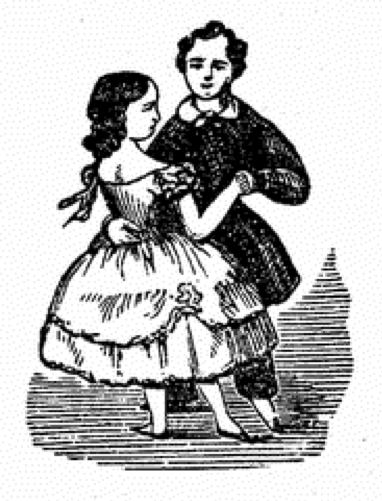 Then commence with the left foot, and take three steps of the Polka Redowa, turning once and a half round (counting three for each step); then pause as in the first part of the dance, by placing the right foot out (while you count two); bring the right foot back again, behind the left (count three—Four bars). Then recommence with the right foot and execute three more steps of the Polka Redowa, and finish as before, placing the left foot out to pause, and then draw it back again—(Four bars). Recommence with the first part, and so on alternately. For the lady, the directions are the same, only reversing the feet. 1st. Take two steps of the mazourka [the lifted version] without turning, springing on the right foot and sliding the left forward each time (two bars); then take one complete step of the polka redowa in turning half round, and pause as before (two bars). Then repeat the same with the opposite feet (four bars), which will bring you round and complete the dance. 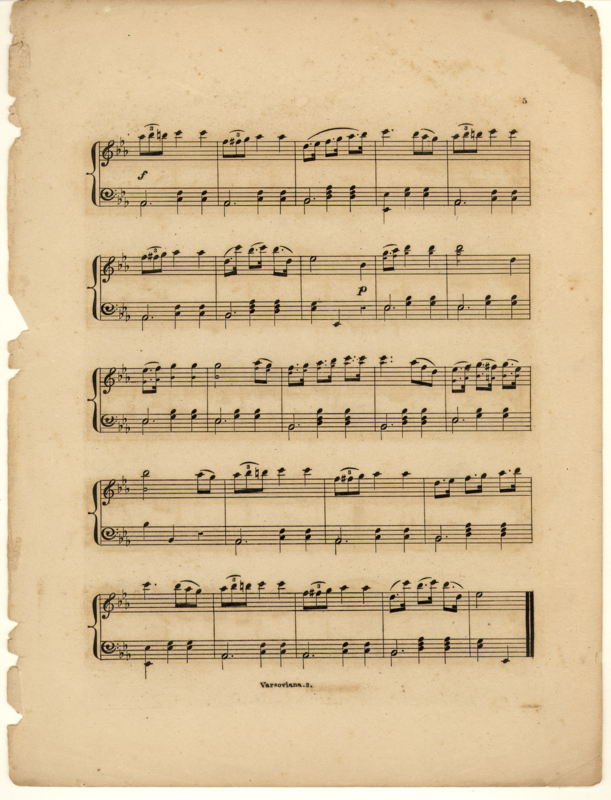 The whole dance occupies sixteen bars of music—eight bars to each part.